After two days of rain Easter Sunday dawned bright and sunny and I was excited to finally get a chance to see the mountains. But so it seemed was everyone else. I started off fairly early but even in my eagerness, there were plenty of people milling around Echo Point with their selfie sticks. It was a short walk from my YHA hostel to Echo Point, the famous viewing platform for the Three Sisters. These rocks, which are said to be the Blue Mountains most spectacular landmark are three protruding rock formations standing at 922, 918 & 906 metres tall, respectively. They are said to be named after an aboriginal legend in which three sisters are turned to stone. Although I had had heard mixed reviews about the rocks, the image really was something to behold. If not for the rocks themselves then for the juxtaposition of their height and the deep vast valley of rainforest which fell away beneath them. Walking along the suburban streets on the way to the mountains there is no indication of what is waiting around the corner. It is not until you finally step up towards that platform that you see the dramatic projection of the landscape with the jutting mountain ridges in the distance, their shape coloured in a bluey hue from the eucalyptus. From the Three Sisters I followed the trail to the Katoomba falls. Nestled just in the rainforest the falls run down the full height of one of the cliffs before disappearing among the trees. The base of the falls, which is where I first glimpsed them, spills into a river in which the sand has a bright orange tinge giving the whole image an eerie sunlit glow. From the falls I continued through the forest towards the collection of man made attractions in Blue Mountains, Scenic World. My walk towards the base stations led me downwards through the tangle of rainforest paths and steep steps. 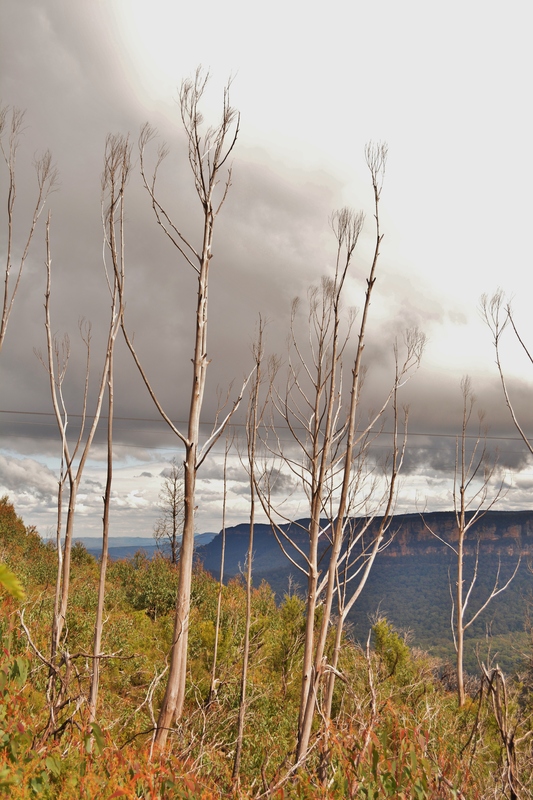 At one point I came out into a clearing with views of the distant Three Sisters and the topmost part of the Katoomba Falls which loomed above me. The rainforest itself was full of smaller cascades of water, some which flowed readily down the rocky surroundings others which just caused small droplets of water to ooze off the rocks and land unsuspecting on your head. When eventually I got to the bottom of this sloping path there were signs directing me towards the ruined castle, a 4-5 hours round trip. However there were also many, slightly more appealing signs to the scenic railway, which would take me all the way back to the top in relative but admittedly, steep comfort. Yes, it was certainly the lazy part of me that was leaning more towards the railway than the further 4 hours plus walking. But equally, the scenic railway, which is the worlds steepest railway, was boasted of as an attraction quite as much as the ruined castle. It was only with a small twinge of guilt then that I lined up to gain a seat on the railway. The railway runs from the dense rainforest floor at the bottom of the Jamison valley up the 310 metres to the top of the surrounding mountains by way of a cliff surrounded tunnel. All of this on a 52 degree incline. It may have been my lazy option but with its glass panelled side and roof it is an astonishing way to view the scenery in itself. Two stops outside Katoomba on the train you reach Wentworth Falls, a small town named after explorer William Charles Wentworth, and home to the famous Wentworth Falls waterfall. It was Easter Monday and according to supposedly reliable weather apps, the rain would only hold off so long. I had therefore decided to make this a short jaunt just to go and see the waterfall rather than following the full six kilometres of the National Pass. I arrived at the picnic area and car park at the start of the trail after a half an hour plus walk from the train station, past grassy parklands and a wide row of houses. The first part of my walk to the falls was through the forest, along muddy paths with wide puddles that had yet to dry out. This stretch ended in a path which actually crossed the top section of the falls itself. The path which stretched over this flat section of river had a barrier on one side and a sign with a picture of where we were currently situated. This came with a warning reminder that on the other side of the barrier was a drop of about 100m. After crossing the falls the pass continues along the side of the cliff face descending down by way of a steep rocky staircase cut into it. The path was first built in 1912 and has since been restored in order to keep these winding kilometres in good condition. I made my way down these precarious steps, with both hands planted firmly on the rails all the while. Having descended back into the forest by the time I reached the bottom, it was not until I came out into a clearing that the full view of the upper tier of the falls came into view. A torrent of water falling in a clean line from the jutting outcrop of the cliff. I had done more walking in the past two days than I had done perhaps all year and yet there was still so much to see. A sprawling wilderness of packed rainforests and waterfalls in the shadow of high reaching cliffs overlooking the wide valley beyond. In other words; a haven of the Australian wilderness. 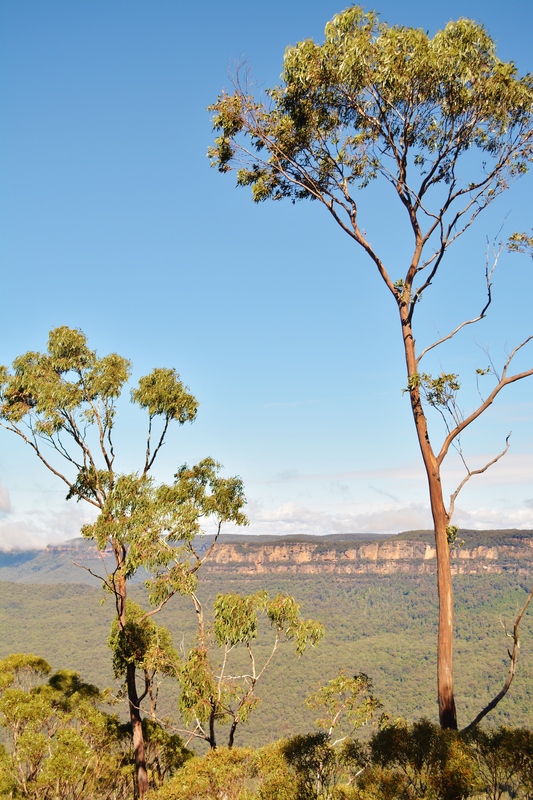 The iconic gum trees giving the mountains the blue of their name and giving the whole place its magical glow.